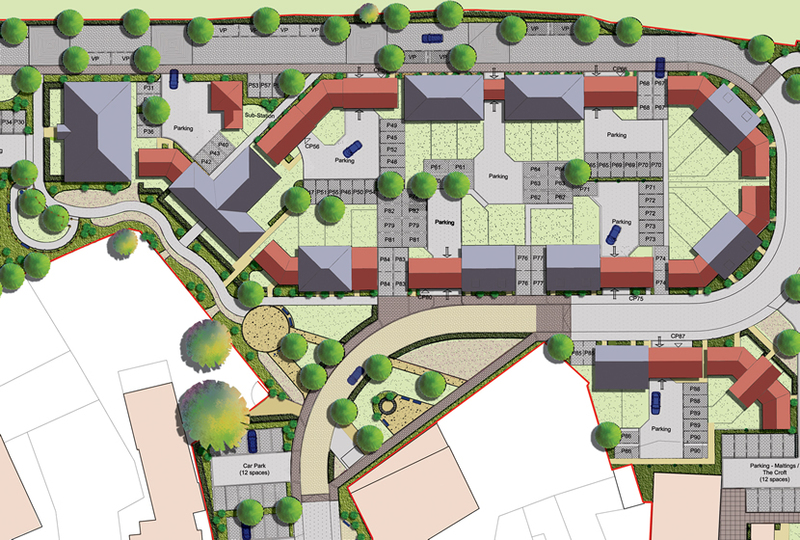 This residential scheme has been designed to complement the urban typology of Needham Market’s Conservation Area. A welcoming landscaped entrance leads into the site from the High Street, acting as a meeting point & seating area that leads into the ‘Town Square’ public realm & residential area. 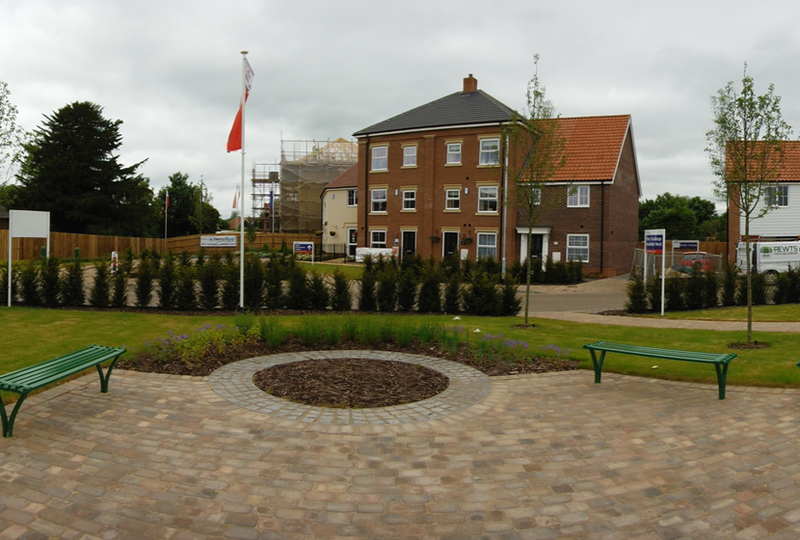 A number of different housing types are located across the site,to include larger 2-3 storey apartment blocks to the north-east & smaller semi-detached private housing, all grouped around semi-private parking courtyards & private gardens, to the south east. Planting includes hedges and mixed planting using robust species with herbaceous introductions to add colour & delight to the plot frontages. A new access road sweeps through the site, from the Town Square public realm, past the Cattle Link tunnel to the apartment blocks to the north. This road is partly surfaced with rustic coloured block setts, to tie in with the public realm surfacing around the site. Car parking courtyards are softened where possible by the use of trees, shrubs & climbers along boundary walls & fences. They are typically finished with tarmac & bays delineated with white lines or concrete setts, adding variety & legibility to the overall scheme. The new ‘Town Square’ area of public realm is surrounded by yew hedges, which enclose & define the open space. New tree planting provides a green vertical structure throughout the site, emphasising main routes, pathways & boundaries. 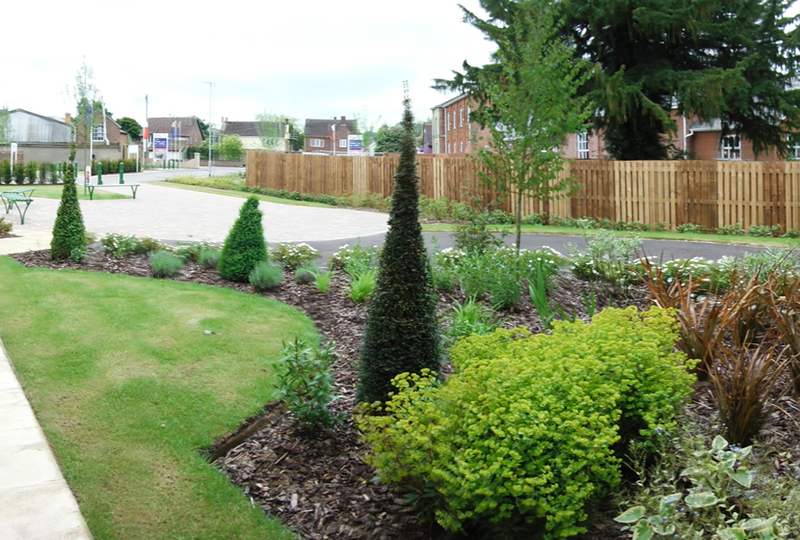 A meandering green link has been created providing a pleasant walk from the Town Square to the housing, through landscaped borders with seasonal displays of bulbs coming up through the grass areas. A new Local Area of Play, (LAP) is provided with a tarmac path & fenced enclosure to provide an area for young children & to play safely. Water easements have been a major constraint to new tree planting in public realm areas.